In the old days, when you wanted someone to share their photos with you, you'd ask for "doubles" — which meant they'd get two prints of the pics and give you the second. In the current digital world, your photos, your friends' and families' photos, and photos of you are spread everywhere. So we thought it might be useful to bring the idea of doubles into the digital world. When you're done with this post, pictures you've uploaded to Facebook, Flickr, Instagram and everywhere else will automatically appear in "double" from in Dropbox. Pictures people tag you in on Facebook will likewise automatically download to your computer. Even the images you see on the internet — on any web site or anywhere — can be added to your "doubles" in a click of your mouse. Here's how to set it up. You need two basic services for this to work. One to link your various accounts together and the other to store your photos. If This Then That: If This Then That (ifttt) is a service that let's you plug information from one service into another — basically, you tell it that when one thing happens (eg, you post a picture to Instagram), it should do another thing (e.g., place that picture in a folder in your Dropbox account called "Doubles"). With a few clicks, we're going to set it up to send all your pictures from a variety of services into a specific Dropbox folder. Dropbox: The cloud storage service Dropbox is the holding bin for all the pictures. Every time you take a picture you'll get a double sent to Dropbox automatically. That's all you need, so let's get those pictures organised. 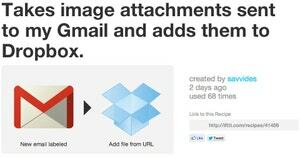 Provided you use a web service that ifttt supports, you can create simple actions that upload pictures you take (or you're tagged in) directly to your Dropbox folder. In some cases you can also limit this to specific tags, or organise the pictures automatically into subfolders. The process for sending all your pictures to one Dropbox location is the same for all the photo services ifttt supports — including Facebook, Instagram, Flickr, and Foursquare. Many of these are already set up for you on ifttt's recipes page, but they're easy to create and customise for yourself. Watch the video at the top of the post for a quick overview of how to set up a custom ifttt trigger, or, for more details, read on. Step 1: Choose Your Trigger Channel From the ifttt Dashboard select "Create a Recipe" and then click "this". You'll see a menu with all the services ifttt supports. To create a trigger that sends your photos to Dropbox select the photo service you want to use. You will need to set up a new trigger for each service. Step 2: Choose Your Trigger and Dump All Your Photos Into Dropbox When you select your service you're given an option to choose a trigger. Each service has their own set of different triggers that do different actions. The simplest method for creating doubles is to choose "Any new photo" so that any photo you take will be automatically head over to your Dropbox folder. When you're done, click "Create Trigger". Step 2.5 (Optional): Set Up Triggers with Tags to Send Them to Specific Folders If you use Instagram or Flickr you have one more great option: "New photos by you tagged". If you select this option you can tag your photos with a label (#holiday2012 for instance) and then send them to a specific folder in Dropbox (we'll get to that in step four). This way you catch all your digital doubles and organise them at the same time. For Facebook you can also set up a custom trigger when someone tags you in a photo by selecting the "You are tagged in a photo" option. Regardless of which options you choose remember that you can set up multiple triggers for each service and organise photos however you like. Step 3: Choose the Dropbox Action Next, click the underlined "that" and select the Dropbox icon. Select "Add file from URL". 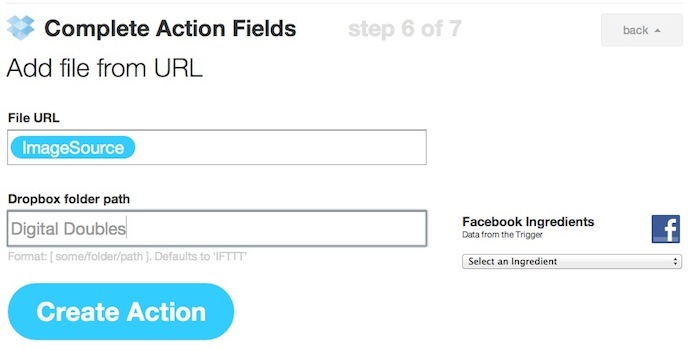 Step 4: Complete the Action Fields The final step is creating your action fields. Since we're trying to catch everything online and create a double you can leave the File URL box alone. Next you have the Dropbox folder path. This is the Dropbox folder your photos land in. You want all your photos from every service funelling into one folder. For our purposes we'll call this folder "Digital Doubles" (although if you're using Dropbox's auto photo upload feature for your SD card pictures you might want to use the same folder, "Camera Uploads"). If you use the tag filter we mentioned in the optional portion of step two then create a subfolder under Digital Doubles (like a Holiday2012 folder). Finally, select "Create Action" and you're done. Ifttt doesn't support every web service around, but workarounds aren't hard to find. 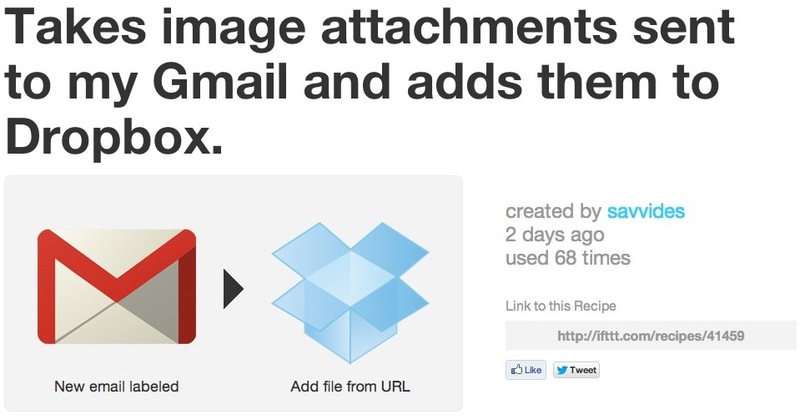 Forward Email Attachments to Your Doubles Folder You can use recipe where labelled emails automatically upload the attachment to Dropbox. This is handy if you get a lot photos directly in your email or if you want to send emails to yourself. Download Images from Any RSS Feed If you don't want to deal with email you can also use an RSS trigger if your cloud photo service supports it (Picasa and Fotki and both do). Select "Feed" as your trigger channel, copy and paste the URL for your photos RSS feed, and follow steps three and four above. iCloud to Dropbox Finally, if you're an iCloud user you can automate your iCloud photos following Apple blog TUAW's guide using the automated organiser Hazel. Click the Bookmarklet button on the top of the page. In the "Dropbox Directory" box, type the directory you want it to go to (Digital Doubles in our example). Click "Create Bookmarklet" and wait a couple seconds for a link to generate. Drag that link to your bookmarks bar of your browser. When you find a picture online you want to include in your doubles album, simply copy the image URL, click the SideCloudLoad bookmarklet, and paste the link. It will automatically upload to your Digital Doubles folder. With that, all your fragmented photo memories are backed up and organised into one handy folder online. If you need some help organising them further or adding metadata be sure to check our guide to cleaning up your photo collection.